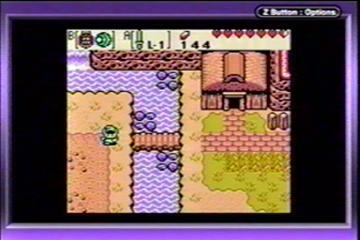 The Legend of Zelda: Oracle of Ages was one of the last big sendoffs for the GBC before the GBA rose to the forefront. Unfortunately, it being a GBC game with the GBA being "the new thing" lead many people to pass it off as "last generation's stuff," or to not even notice it at all among all the GBA news. Which is rather unfortunate, since, this was easily one of the best games ever created for the system. For anyone who is a fan of the series, this game really shouldn't be missed. It's a blend of everything that has made other games in the series great, with many new additions to make interesting along the way. The Zelda group of games for the GBC was originally planned as a Trilogy of games, to be released all at the same time and which would interact with each other. Development time and problems lead the trilogy to be cut back to a pair of games, which we now have as Oracle of Ages and Oracle of Seasons. These games were released on the same day, and are very closely tied to each other. Each game featured various codes which you could get in one game, and send over to the other to produce interesting results. As well, once you beat one of the games, it would give you a code to start a new game on the other, which would give you a significantly different story from the one you would have normally experienced, since, of course, you having that code meant you had already played through the story of the other game. This feature, however, won't play a significant factor in the review. It will be touched on again later, but, for the most part, this review is written as Oracle of Ages as a stand-alone game. That is, it isn't a matter where "You need to purchase both games or you'll be missing out on half the experience" or anything like that. Each of the two games are perfectly capable of standing alone as its own game. The codes and exchanges between the games are merely a bonus (albeit a very interesting and creative bonus) for people who choose to buy and play both games. Again, this will be touched on a bit through the course of the review, but, enter into this review with the expectation of having shown to you what Oracle of Ages is about, not to try to show you why you need to buy both of the games. The first thing that might strike one about Oracle of Ages is, initially is seems strikingly similar to Link's Awakening. The graphics are in the same style, the sound effects are the same, and much of the gameplay is the same. It features that same overhead map, aside from in certain places where you go below the surface and into a small side-scrolling area. Much of the items are the same, with the return of things such as the Roc's Feather. After that initial impression, however, as you begin to make your way into Oracle of Ages, you'll find that, if anything, it has more in common with Ocarina of Time and Link to the Past than with Link's Awakening. The story starts off with the evil Veran tricking Link and kidnapping a singer named Nayru. After Nayru is kidnapped, you find out that she is really the Oracle of Ages. Veran has taken her and has used her powers to go back into the past. Here, she has begun causing havoc, which, needless to say, is causing a great deal of chaos in the future. Link, being the hero that he is, finds a way to follow Veran into the past, and sets off in search of Nayru. From there, Link finds himself zipping back and forth between the Past and Present, fixing the problems that Veran is causing, and following her trail to the end. Unlike in Ocarina of Time, which required you to trek all the way back to the Temple of Time any time you wanted to change time periods, Oracle of Ages gives you other methods to do it, and works it much more seamlessly into the gameplay, actually more similar to Link to the Past's light/dark world. Initially you are only able to go back and forth at certain spots, but, later you will gain the ability to go back and forth at any point you choose. Often you go to the other time period simply for the change of scenery, to get around certain obstacles. Or, it might require you to push a small seedling underneath a cliff in the Past, go to the Present where it will have grown into a vine, where you can now use it to climb up the cliff and proceed along the top. Again, it really feels like a combination of Ocarina of Time's "changing scenery over time" and Link to the Past's "working it smoothly into the course of the gameplay," and, it comes out very well. 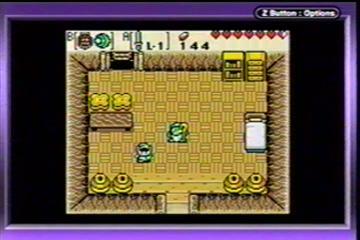 Aside from the time-changing element, the gameplay itself is very similar to Link's Awakening. The overworld, with the same map you can look out made up of a bunch of individual squares, has towns and forests and such that you'll have to fight your way through. You'll adventure to dungeons, where you'll have to solve puzzles, fight enemies, and at the end defeat a boss to get, in this game's case, Essences of Time. Gameplay is from the traditional overhead view map with, again, a few places where you will go underground into a small side-scrolling area. You'll hit enemies with your sword, flip them over with a shield, throw stuff at them with a Bracelet, all of that sort of stuff that you're familiar with from Link's Awakening. One thing to note about Oracle of Ages, not only in comparison to Link's Awakening, but also in comparison to Oracle of Seasons, is that, Oracle of Ages' dungeons are very puzzle-centered. That is, while there are still certainly enemies you'll have to fight along the way, your main challenges in each dungeon won't so much be killing enemies and staying alive, as it will be figuring out how to get past obstacles and how to progress through the level. This isn't anything "new" compared to many of the other Zelda games, just, in this one it takes the main focus of things. So far, much has been discussed about how Oracle of Ages is similar to other Zelda games, and how it compares to them. None of this is to say, however, that there aren't new and different aspects of this game, since, there most certainly are. While many of your favorite items have made a return, there are a number of new items you'll find as well. One thing inparticular is, there are many different Rings you can find during the course of the game. These rings are unidentified at first, but, taking them to a Jeweler and getting them identified will reveal their effect. You can only use one ring at a time, so, it's up to you to decide which one is most useful for what you're heading out to do. Another thing to mention, are Seeds. There are five different types of seeds in the game, which have various effects such as burning small objects (Ember Seed) or attracting enemies (Scent Seed). Initially you can only put these seeds on the space directly in front of you, but, later on you'll get a Seed Shooter which will allow you to shoot the seeds at distant objects. Again, there are a number of new items which you will come across during the course of your adventure. Another thing that is new in this game, is, Animal Friends. During the course of your adventure, you'll run into some animals that can help you progress. Animals such as a Kangaroo who can leap up and help you cross cliffs, or a Fish who can help you cross deep waters. These are just occasional occurrences, they aren't "items you can use" or anything like that. They're just another fun thing that has been added in to make the adventure a bit different. There are certainly plenty of other new and interesting things to discover during the course of your adventure, this is just a brief overview of some of the different stuff that you'll encounter. While the items and such have their core with stuff that was introduced in other Zelda games, this one certainly has much going for it as far as new stuff that it is introducing. As mentioned earlier, Oracle of Ages was among the later released for the Gameboy Color. So, while one might think this would cause is to pale comparatively to Gameboy Advance games, it certainly more than holds its own against the offerings for the newer system. The graphics are bright and vibrant, full of life and detail. Everything is very well designed and put together, and, really, if it wasn't for the fact that you clearly had a Gameboy Color game sitting in there, it would be hard to tell the difference. With sound, as mentioned, many of the sound effects are borrowed from Link's Awakening, so, there's not too much new there. All of the game music and everything is all very well done, however, and really adds well to the game. So, don't just pass it off as being "the last of the Gameboy Color games, before everything moved over to Gameboy Advance." It stands up very well in comparison. While for the most part the various "secrets" and "passwords" and such haven't been mentioned in this review, due to organization and the fact that a person might not necessarily want to have to go out and buy two games at once, just to briefly mention, the interaction between Oracle of Ages and Oracle of Seasons is spectacular. If you like this game, it would certainly be highly recommended to pick up the other as well, and, as you're playing through them, the connections the two share between each other are really fascinating. Codes to bring from one game to another, items and story parts and various other details, which are all transmitted from one game to the other by these codes. While the game has plenty of replay value on its own, if only because of how fun a game it is, if one has both games and is playing back and forth with the codes, the replay value of the two games together is really among the best that has ever been created. Zelda: Oracle of Ages has everything a fan of Zelda games could want. It has the return of some familiar things, the addition of some new things. It has a spectacular core gameplay, and new twists and turns to make things interesting. While the game often seems to fall between the cracks when people are thinking of the Zelda series, it definitely shouldn't be missed by anyone who enjoys the other Zelda games. It has everything that one could hope for in a Zelda game, all perfectly blended together, and combined into one nice little Gameboy Color cartridge.